The new nightmare mascot is named "Gritty," and it looks a bit like the Philly Phanatic if it was orange and didn't have a vuvuzela for a nose. Presumably, this muppet who lived under power lines was given many stamps of approval before Monday's big reveal. The approval for Gritty seems to have stopped there, however. Fans instantly pounced on the hairy creamsicle, poking fun at pretty much everything about it. The criticism seems fair, but, let's be honest, Gritty is great. Classic hockey hair. It has a hilarious name that old school hockey fans will love and younger fans who like the speed of the game more than fisticuffs will love to make fun of. It kind of looks like a Muppet and the Muppets are great. Some people think it looks like Animal. Animal is great. It's a crazy jumbled up nightmare and that's way better than some boring nonsense like a walking baseball or whatever this is. Gritty is terrible. Gritty is great. Here are some of the best responses to the Flyers sticking eyes on a pile of hair from the shower drain. I will say this: if you're going to bring in Gritty, BRING IN GRITTY. Don't just put him up on the concourse and have him wave his arms to pump up the crowd. Have him chugging beers and screaming SHOOT and swearing at the coach. Really lean into it, man. The Flyers had a sense of humor about it all, giving a threatening response to the Penguins "lol ok" tweet. 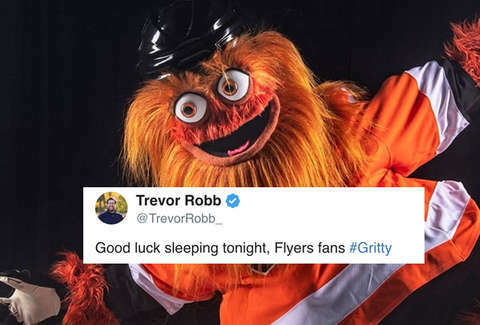 Also in the Flyers favor is that Gritty won't even come close to being the worst hockey mascot of all-time. That honor will forever go to the very short-lived Scorch, the mascot for the Adirondack Flames (affiliate of the NHL's Calgary Flames). Scorch was introduced to the world as the "sole surviving flame from the 1864 fire that ravaged the city of Glens Falls." That introduction involved a video where a firefighter tries to put out Scorch. In response, Scorch kills the first responder. If you want to take your photo with the sentient pile of hair salon rubbish near a nuclear waste site, Gritty will make its debut at the Flyers home opener on October 9 against the San Jose Sharks.